In our 20 years in the aftermarket industry, US Speedo has never missed a SEMA Show. Each fall, we travel to Las Vegas, NV and participate in “The Big One”. The industry changes every year but one thing has been a constant, each time we return from a successful SEMA show we are re-focused and rejuvenated. The SEMA Show draws an estimated 150,000 people! We meet and greet as many as possible, talk about our product, install custom gauge faces and, most importantly, listen to what people are saying about our custom gauge faces. Being able to understand our customers wants and needs is, without a doubt, the most important part of our yearly SEMA trip! 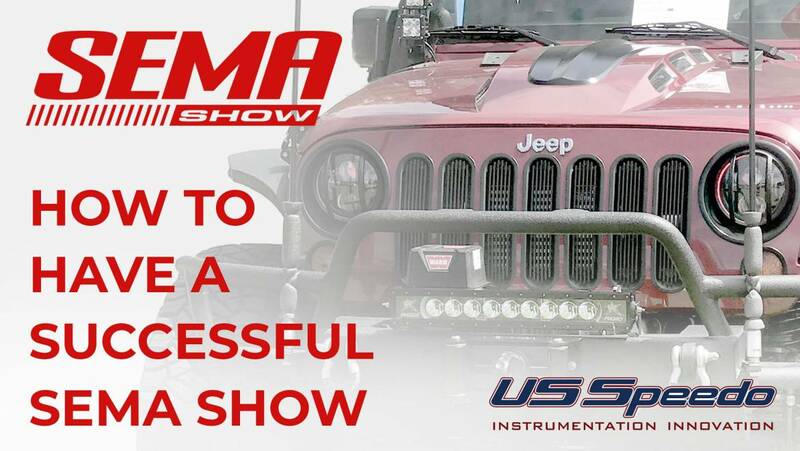 Here are some tips to have a successful SEMA Show. Have a plan!SEMA is huge! If you haven’t been, it would be hard to describe the scale of the show. It is so immense that were you to walk the entire show for the duration of the show and visit all 2,400 plus exhibitor booths, you would be spending mere seconds at each booth. With limited time like that, a plan is essential. We set up meetings and installs prior to the show. That way, we can manage our time a little better. Obviously, everyone is busy. Being respectful of your customers’ and contacts’ time is very important. Have something to show!SEMA can be a bit of sensory overload. Everywhere you look, theres another great, new and interesting product. As a company, you need to be able to captivate a potential customer. This is not as easy as it seems. There is a lot going on and many of the attendees are present at the show every year. You need to think less about “bells and whistles” and more about what your market wants. 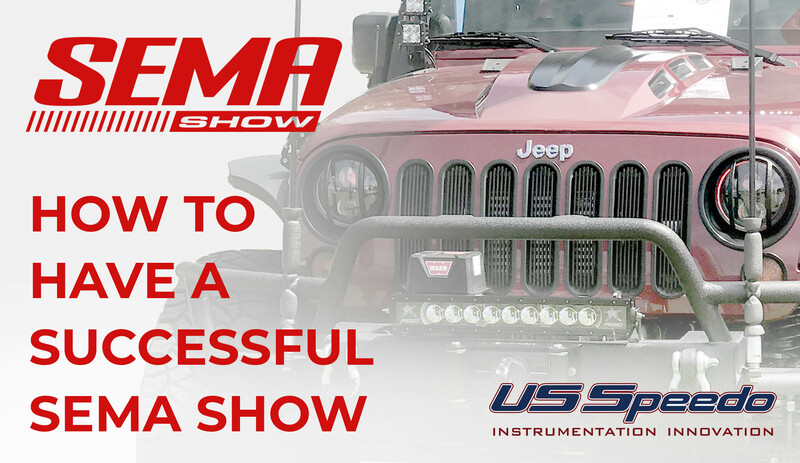 Planning for SEMA Show should start in the first quarter and it is then you should make decisions about what products you might want to show at SEMA. For Example, this year, 2018 Jeep Wranglers came in 2 variations. The 2018 Jeep Wrangler JK and the new 2018 Jeep Wrangler JL. The speedometer of the 2018 Jeep Wrangler JL has been completely redesigned. We launched our Daytona Edition Custom Gauge Face for the 2018 Jeep Wrangler JL this past summer and are very excited about us. We will be focusing heavily on this product at SEMA. Participate in the New Product ShowcaseThe New Product Showcase is a great way to drive foot traffic to your booth. We have had several award winning parts in the New Product Showcase over the years. This is where you place the best new product you have to offer. This product should also be featured at your booth. Networking! Networking! Networking!For us, there is no better way to display our product than in an actual vehicle. Every year, we install many, many, custom gauge faces in vehicles at other booths. During these installs, we get to meet lots of people from other aftermarket companies to builders and upfitters. Getting to know these people and forming lasting partnerships is essential. Its also fun! There are some truly great people in the aftermarket industry! We’re all working hard but don’t forget to have fun!It’s easy to get caught up in the torrent that is SEMA. Do yourself a favor and remember to have some fun. Look around and enjoy yourself. There are some great aftermarket products out there. Try not to be so focused on your own SEMA that you miss seeing some really great products. Its important to play the role of the customer. What catches your eye? What is interesting to you? Any cool new tech? Having that knowledge and keeping your finger on the pulse of the aftermarket industry can help you make important decisions about your own product line. Follow upThe week after SEMA is make or break. Everyone is busy following up with contacts they’ve met at the show. It is extremely important that you reach back out to your contacts when you return from the show.